7 Commercial Real Estate & Properties in Bundall are listed in 2 categories. We have 7 OfficesSale and 1 ShowroomsSale . 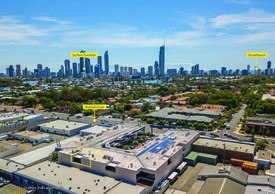 89m2 office investment to be sold as a going concern. Fitted with a reception and waiting area, 2 offices, a boardroom and open plan space. A huge balcony gives plenty of natural light through the tenancy. 3 car parks are also included. This is an absolute must to inspect! Contact the exclusive agent below. Reception with a waiting area 2 Offices with sliding door Boardroom / open plan Cabled Air conditioning Balcony Plenty of natural light 3 car parks available Approx This property is being sold by auction or without a price and therefore a price guide cannot be provided. The website may have filtered the property into a price bracket for website functionality purposes. Disclaimer: Ray White has not independently checked any of the information we merely pass on. We make no comment on and give no warranty as to the accuracy of the information contained in this document which does not constitute all or any part of any offer or contract by the recipient. Prospective purchasers / lessees must rely on their own enquiries and should satisfy themselves as to the truth or accuracy of all information given by their own inspections, searches, inquiries, advices or as is otherwise necessary. No duty of care is assumed by Orchid Avenue Realty trading as Ray White Surfers Paradise Commercial divisions toward the recipient with regard to the use of this information and all information given is given without responsibility.